Each year designers of all stripes eagerly await Pantone’s announcement of its Color of the Year. We can expect to see this color pop up everywhere in the new year, from clothes to furniture. If you like to keep up with trends, it can be difficult adding the color into your, especially if you don’t want to repaint or update your furniture on an annual basis! If you don’t want to commit to painting a way with this year’s bold color, here are a few ways to incorporate this year’s (and future year’s) Pantone Color of the Year without the major commitment. This year’s color, Living Coral, is a warm and vibrant color that definitely makes a statement! If your interior design tends towards a cool or neutral color scheme, you’ll have no problem adding pops of color through smaller accessories. Not only is this a cost-effective way to warm your home, it’s also perfect for those who don’t want to commit to the color. Pick out coral hued pillows, vases, or accent rugs, or even throw blankets. Even this bright color can be used in the bedroom, where calmer, darker colors tend to reign supreme. Pairing Living Coral with a darker neutral like navy blue can still invoke a calming, relaxing vibe. Pull in the coral tones through bedding or even an upholstered headboard. Living coral evokes sunsets and beaches, so if your bathroom needs a jolt of energy, coral is just the energizing shot you need. Use coral colored bath towels, bath rug, shower curtain or artwork to bring in some tropical vibes. You don’t need to wait for a special occasion to fill your home with flowers. are perfect for every day, not just special occasions. There are plenty of beautiful flowers that come in this beautiful color that will brighten any day. Create beautiful table arrangements or bouquets will with Big Fun or Coral Knock Out roses, Gerbera daisies, dahlias, Apricot Impression tulips, Coral Charm peonies, Valerie Harrod sweet peas, Madam Butterfly Bronze snapdragons and Dreamland Coral zinnias to name a few. If you have a green thumb, you can even plant a Living Coral inspired garden! 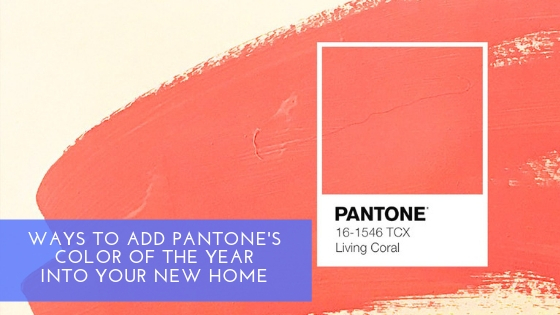 There’s plenty of ways to incorporate Living Coral, Pantone’s 2019 Color of the Year, into your home. But these decorating tips means you can easily update your home for future Pantone Color of the Year as well!